Big labor sees the writing on the wall as some members of the “Change to Win” alliance and AFL-CIO look to rejoin forces as union membership dwindles. The 1.3 million members of the United Food and Commercial Workers will vote on returning to the AFL-CIO following negotiations. Between 2001 and 2005, The United Brotherhood of Carpenters and Joiners, United Food and Commercial Workers, Laborers’ International Union, Unite Here, and United Farm Workers left the AFL-CIO. Additionally, after a series of ideological disputes within the AFL-CIO, the 1.7 million members of the Service Employees International Union and 1.3 million members of the International Brotherhood of Teamsters withdrew in 2005, dealing a major blow to the AFL-CIO. The SEIU and Teamsters alone paid a combined $20 million in dues toward the AFL-CIO’s $120 million budget. The SEIU then spearheaded the formation of “Change to Win” as a response to the AFL-CIO’s monopoly on labor in the country. The leaders of the breakaway faction said they are taking flight because of distress over what they described as the AFL-CIO’s ineffectiveness in stopping the long-term decline in union membership and making labor more relevant to the challenges of the modern workplace. The members of the newly formed “Change to Win” organization had to be joking. 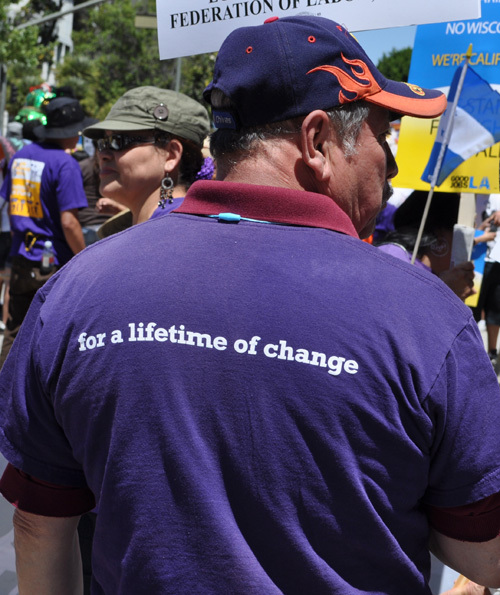 Many of its members, namely the SEIU, have been some of the heaviest hitters during elections. For example, the SEIU spend almost $70 million campaigning during the 2012 election cycle for various Democratic candidates,outspending the President’s Priorities USA by $15 million. The United Food and Commercial Workers spent approximately $9 million in the 2010 and 2012 elections federal election. Both of these organizations have increased political spending significantly since 2005. Now, the 1.3 million strong United Food and Commercial Workers and 12 million member AFL-CIO can throw money at politicians together. The UFCW is looking to rejoin the AFL-CIO after the Laborers Union and Unite Here returned in 2009. Ironically, the UFCW is requesting a dues reduction as a condition of returning to the AFL-CIO.